The 2013 triathlon season is now finished and we hope you all had a good season. It’s time now to kick back and meet up without the togs and tracksuits (although its entirely up to you what u wear) for and end of season knees up. 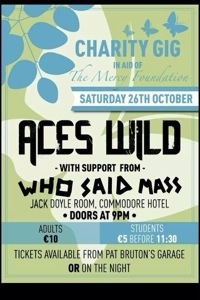 We hope to support a local band (Aces Wild) and a very deserving charity, The Mercy Foundation. Date – Saturday 26th October.